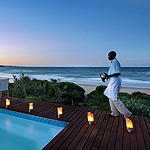 I discovered a new coastal gem called White Pearl on the southern reaches of the Mozambique coastline a few months ago but I always think it prudent to wait until a lodge has found its feet before sending clients. Established for over a year now, this 22-room hotel styled in super-cool fresh colours is simply fabulous. It offers chic and friendly sophistication. Each room has a plunge pool, and there are a further 2 guest pools and miles of magnificent sandy beach in either direction with no one to disturb you. Some of the best diving is to be found here, and there is a high chance of seeing dolphins. There is easy access from Maputo by heli which has flights from Cape Town and Jo’berg. Some of you may find it reassuring to see that lions are not too interested in homo sapiens – well, at least these guys think so! On a more serious note, lions are increasingly endangered, their numbers having declined by some 80% over the last 40 years. There are probably fewer than 25,000 left in the wild. 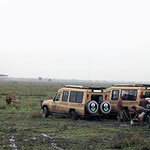 Of course, on safari you expect to see them, and our guides are brilliant at finding them for you. One lodge in the Sabi Sands area of the Kruger that struck me as especially good was Savanna Lodge. It is a small, friendly place and besides lions the leopard viewing is awesome. It links well with White Pearl above too. But most importantly the guides and management have been at the lodge donkey’s years which I think is a really important factor in ensuring a wonderful bush experience. Continuing on the lion theme this national park has a lion for its emblem. 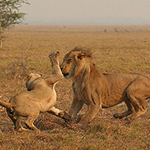 In the 1960s Gorongosa, which hardly anyone has heard of these days, had far better lion viewing than the famous Kruger. The civil war ended a good while ago, and this is the new hot-spot for an out-of-the-way safari adventure. I know a great little bush camp where the guides will take you on an in-depth exploration of the bush where few tourists go. The rejuvenation of Gorongosa by the Carr Foundation is visionary. There is good access from Johannesburg to Beira by scheduled jet from where it is a charter hop onto the park airstrip. Stay 4 nights and pay for 3. The Selous game reserve has come a long way since I first started sending clients there in the 1990s. In those days there were a couple of lodges and Richard Bonham was still doing his legendary walking safaris. You had to charter in, but now there are regular scheduled 50-minute plane rides from Dar es Salaam. The reserve is vast so it is still a wilderness safari. 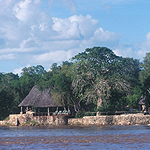 My favourite lodge and one of the original has an iconic position on a small curve of the mighty Rufiji River. The hippos below your room are, it must be said, a bit noisy at times, but your guides will take you on river safaris up to Steiglers Gorge for breakfast on the sand banks where minutes earlier crocodiles were basking in the sun. Fly camping, walking, a high chance of seeing wild dogs, top service and that amazing setting make this a top safari destination in Africa. Stay 3 and pay for 2 before Christmas. Offers subject to booking conditions and availability.